26-Aug-2010 -- It was 25°C at mid morning when we reached this confluence area after leaving Brooks. Vauxhall claims to be the Potato Capital of the West. The town has a welcome sign with two cartoon potatoes, "Sammy" and "Samantha". Driving south from Vauxhall on Highway 36, then east on Secondary Highway 875, and north on gravel Range Road 154, we came to a place to pull off onto the edge of a field where we could leave the car. From our car we walked some 463 meters to find the spot. 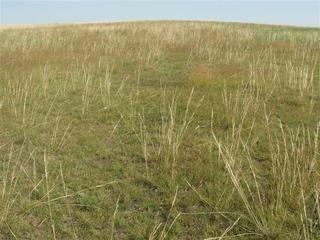 The ground cover consisted of prairie grasses, wild flowers, thistles, rocks, cow patties and some mushrooms. There were animal burrows to avoid falling into. Grasshoppers were hopping about, a few mosquitoes were spotted and birds were singing. Cows off to the Southeast could be heard mooing. One unfortunate cow's carcass was off in a field 150 meters from the confluence. Life is harsh on the prairies! It is possible that coyotes killed it. To the Northeast pump jacks, oil tanks and buildings involved with the oil industry were visible. Far off to the west farmers were harvesting a crop with a combine. It was a beautiful day for confluence hunting so off to the next one. #3: The view South. The "dots" in the far field are cows. #4: The view West with cow patties in the foreground. #5: Overview looking NW. Our car can be seen in the distance. #7: Cow carcass found 150 m East of the confluence. #8: Burrows made by some animal. Careful where you step! #9: Mushrooms growing on a cow pattie. #10: Looking SE towards the confluence (463 m away) from the open gate off Range Road 154.